Valentine’s Day is, essentially, a whole day centred around people spending money on their significant other – it’s the stuff marketeers dream of! And with less than a month to go, now’s the perfect time to start planning your business’ marketing strategy. So, if you’re ready to burst your business out of your January slump, here are our top 14 valentine’s day marketing ideas to get your seasonal campaigns rolling. As well as telling customers that time is running out, Birchbox have also included a couple of last-minute gift options that could push a customer to make their decision there and then. Sending a marketing email to your mailing list is a great way of achieving a number of different goals your business might have. Depending on what spin you take, it could help you to build loyal relationships, promote a deal or even just boost brand awareness. • Create a clear subject line – these get 541% more clicks than clever or ‘punny’ subject lines. Add the word ‘Valentine’s’ and remember to include a heart emoji (or two)! • Choose the right time – most V-day promotional emails are sent 6-8 days before, depending on shipping, but it’s important to consider when your customers are most likely to make a purchase. • Connect with your customers – like with every email you send out, you need to remind customers that you value them. And there’s no better time than Valentine’s Day for that! There are loads of different Valentine’s themed offers you could run. You could go down the ‘couples’ route and run a special 2 for 1 offer, couple’s specials or even a competition involving different tasks for two. Or, why not play on the date? Valentine’s Day is always on the 14th February, meaning ‘14’ is a pretty significant number. Offer 14% off or run a deal on your top 14 products. One of our favourite Valentine’s Day campaigns was BeCharming’s Share Your Love Story contest. 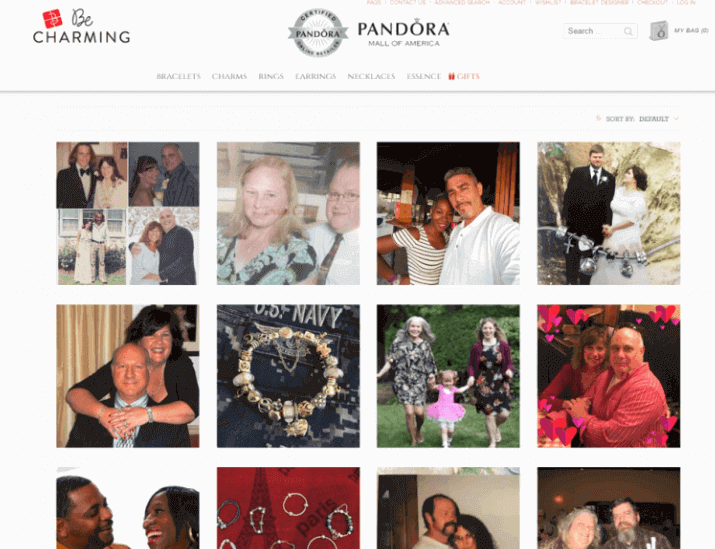 To boost engagement, the contest invited customers and social media followers to share their love stories for a chance to win a love-themed Pandora charm. This is a great way of creating a buzz around your business because it’s sure to tug at emotions. By creating an emotional connection with customers, this is one way to build brand loyalty over time, which is a common aim for small businesses. In 2019, social media is a truly powerful tool. As well as 63% of marketers finding social media beneficial for building a fanbase, 75% also noticed it increased their website traffic. If Instagram is your medium of choice, you’ll know that hashtags are what get you seen. These are the things that people use search for to find accounts they like, meaning your post’s reach is dependent on these. In fact, posts with at least one hashtag averages 12.6% more engagement than those without! All it takes to create a #winning hashtag is a little bit of research. First, take a look what your competition is doing and what works well for them. You can click directly onto their hashtags to see how popular they are. There are also online tools, such as hashtagify.me for Instagram and Twitter, that show you what how popular your favourite hashtags are doing and also suggestions based on what’s already trending. Pick and choose a few hashtags that are relevant to you, relevant to Valentine’s Day and also popular enough for people to search. It might take a bit of trial and error to figure out which tags, and also how many tags, works for you. B2B business don’t have to miss out on this holiday. Although it’s wise not to overdo the love hearts and pink bows, having a section of your e-newsletter, a social media post or even a section at the bottom of an email dedicated to Valentine’s day can be a fantastic way to keep clients engaged. Too much and you could risk annoying your customers – a lot will have only signed up to your mailing list to hear about any offers. We recommend creating an offer to show customer appreciation. That way, there’s added value that’ll leave your customers feeling positive! 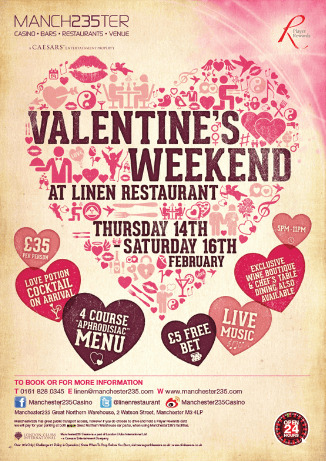 Or, why not team up with one of your B2C clients for a special Valentine’s promotion? It’s a great way to get your business’ name out there and you might even build on your existing customer base. Direct mail is a great way of standing out this holiday. And with 48% of people not even buying their significant other a card in 2017, sending one to your customers might just put you in their good books. As discussed in our free 2019 marketing cheat sheets, personalisation is going to be a huge trend going forward. According to econsultancy, 44% of consumers say they are likely to become a repeat buyer after a personal experience. That’s why it’s crucial that, when possible, you send handwritten cards. 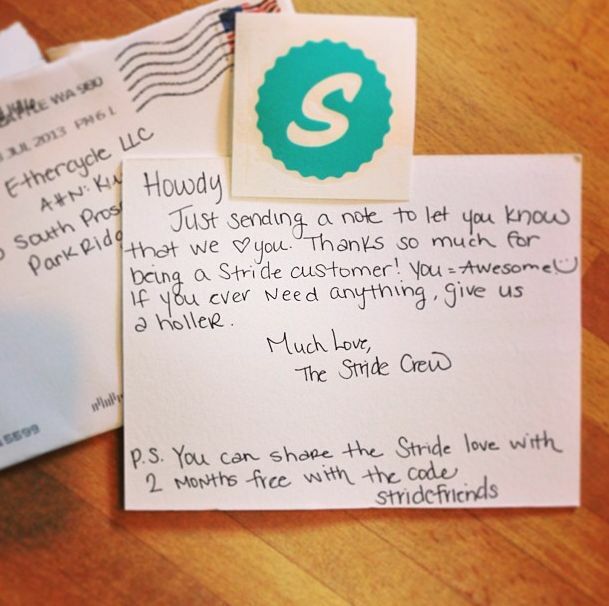 The note and sticker above from Stride is a perfect example of this. 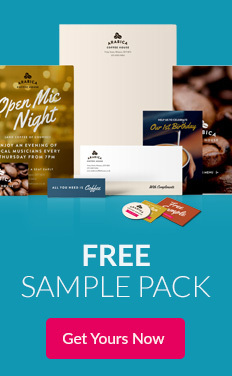 By coupling a friendly tone of voice with a discount code, they’ve made their mailer pretty much irresistible! It’s like the holy grail of marketing tactics! If you can find a way to add a romantic twist to your giveaway, you’ve nailed your Valentine’s Day marketing. This will be easier for restaurants, cafes or businesses that offer some kind of experience. You can just ask people to enter to win a trip, or a free meal. 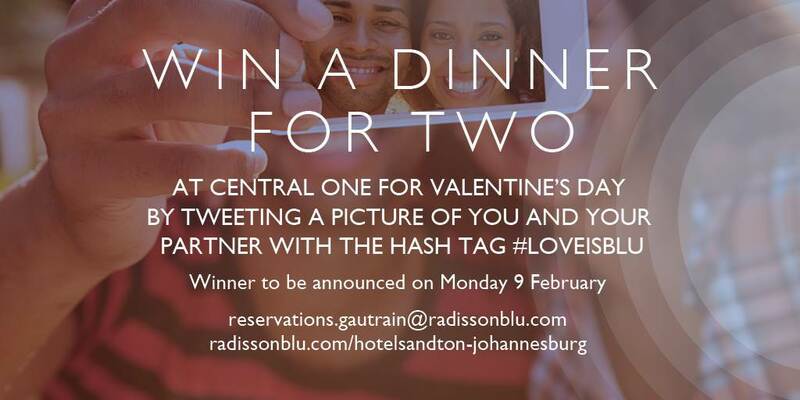 Radisson Blu asked used this ad to encourage people into joining their give away. All they had to do to enter was post a picture of themselves and a love one on Twitter. What makes this so easy – for both the company and the customer – is the use of the unique hashtag used for entry. Just search for it on Twitter and you’ve got a full list of entrants! If your business doesn’t already offer a product or experience that’s perfect for two, you can always make your own promotional merchandise. Branded t-shirts, couple’s mugs and even custom tote bags are super easy to print and affordable. Incorporating charity or volunteer work into your marketing strategy is never a bad idea. The help greatly benefits your local community and the good PR can benefit your company. And who said spreading the love was limited to romantic relationships? What’s more, millennials – who most businesses would class as their target audience – love to be associated with companies that do good. Whether that means they’re environmentally friendly or involved in charity work. There’s a reason why the day after Valentine’s Day is also known as #singlesawarenessday; not everyone is in a relationship. As well as offering amazing discounts and/or deals to couples, it’s a good idea to a more generic offer too – one that can benefit everyone. After all, you love and appreciate all of your customers. So, let them know that! Instore advertising and flyer handouts ensure that everyone knows what deals you’ve got on during the run up to the holiday. Everyone loves a sales hype, especially since there’s over a year to go until the January sales! We recommend tweaking your branding so your marketing materials are still instantly recognisable, but are also perfect for Valentine’s Day. Fancy an awesome cross-selling opportunity? Valentine’s Day is it! • Valentine’s Day outfit – convince customers to buy their dress and bag with you so they’re ready for their dream date. • Date essentials – this could include anything from a special cutlery set to a recipe kit or even aftershave. • His and hers – try matching mugs, socks, bedding… anything! • Last-minute gifts – write a blog or create a free download including all the best last-minute gifts (that they can buy from you, of course). Ever had a notification from an app on your phone telling you about the latest deal? That’s called a push notification and they’re great at getting a user to take a certain action. People always have them phone with them, and your notification will pop up just like a text message notification – possible with a vibrate or tone. They’re available on a range of platforms, including iOS, Android and Windows. 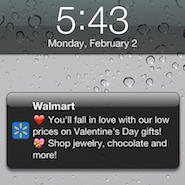 Walmart have used love heart emojis to make their push notification look extra appealing and eye-catching. This also makes the notification look even more like a message from your friend, making it more likely that the user will open it. 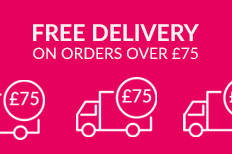 Is there anything more persuasive to prospect customers than free delivery? If your business can’t afford to offer free delivery on every order, try setting a minimum order value threshold. For example, ‘free delivery on all orders over £50’. Make sure to set it a little bit above average order price; this is also a great way of bumping up the average to cover the costs of offering free delivery. One of the key ideas behind marketing is to make purchasing from your company as easy as possible for customers. By having all of your Valentine’s products, offers or specials all together on one convenient web page is a great way of doing this. CyberPower PC have managed to link the theme of love to the products they sell by referencing computers in the page title, ‘Love @ First Boot’. This is a great way of incorporating Valentine’s Day into a landing page without alienating, or putting off, customers. There are plenty of features across social media that are great for quick wins if you’re looking to boost engagement over V-day. One of these, which is common to most social media sites, is polls. You might have already used polls to get feedback on your products or to help decide on a future direction. But the reason they’re so effective is because people find them fun! So, ask some fun Valentine’s themed questions and watch the votes fly in. Top tip: make the question and answers short and sweet – social media users will be more likely to engage with them that way! From digital to print, there are plenty of opportunities to give your business a boost this Valentine’s Day. We love to see your finished print creations, so make sure you tag us @instantprintuk or #instantprintuk for a chance to be featured on our channel!